Hi again everyone! Today will be another two post day to try to catch up with all that I have to swatch, so be ready. :P First up I have two newer duos from Doctor Lacquer! Botany Plants Lately? contains pink, yellow, and lavender flowers along with various multi-sized pastel-colored hexes in a milky white crelly base. Shown is 4 coats with top coat. So I will give a fair warning that I haven't been able to fine tune the new camera to pick up this polish well. The glitters do peak out a bit more than my picture show. They look really pretty squished in the crelly base and give off a nice subtle over all look. :) Formula was a pretty streaky in the first 2 coats, but evened up nicely in the third and fourth. I would recommend using thicker coats to help build opacity quicker and because I found with thinner coats sometimes they "pulled off" some of the polish from the previous layer. Alternately you could also layer this over a white base to help. :) I'm Lavender Rain is a milky white crelly with various sizes and colors of pastel dots. All nails are 3 coats with top coat. I chose to layer both of these over colors from Doctor Lacquer's Coholorful Traits Collection, but a bit of warning since my lighting wasn't set up for holographics it only "caught" the glitters from this duo and not so much the base colors. ;) So the polishes from the Coholorful Traits Collection are holographic you just can't tell from these photos. 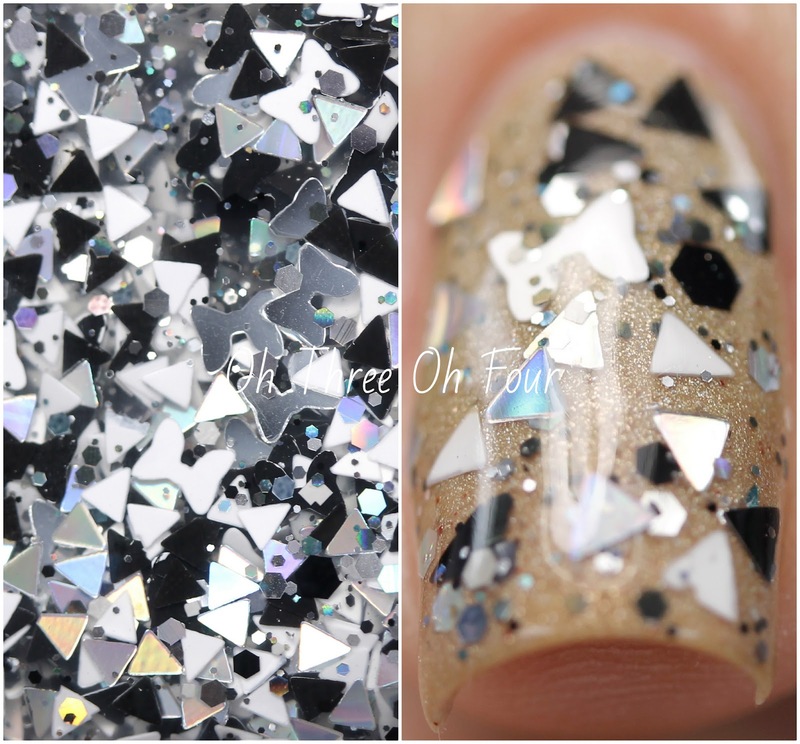 Polygon Flash is a clear based polish with various white, black and silver holographic glitters. Here is 1 coat dabbed over 3 coats of Optimistic Youth. Polygon Flash lives up to it's name in a being pretty flashy! :P The added black and white glitters help balance out the silver holographic, so they aren't giving you Photokeratitis (check out the listing for Polygon Flash for the meaning of this ;) ). Formula was great! I chose to use the dabbing method just to get more glitter in less coats. Pythagorean Fiesta has a clear base with red, pink, purple, yellow and blue triangle shaped glitter. All nails are 1 coat dabbed over 3 coats of Mysterious Love. Both of these duos are available now through Doctor Lacquer's etsy storefront and DoctorLacquer.com (where they are available separately as well)! Make sure to follow Doctor Lacquer on Facebook, Twitter, Google+, Instagram and Pinterest!